A near-perfect solution for all of your guitar tech needs. Quality tools, all in one place. Set-up guide. Easy to lose clear plastic string winder. For many players the closest we get to a 'tool kit' is one of those Swiss Army knife-like multi-tools. Well, USA tool company CruzTOOLS has one of those - the excellent GrooveTech Guitar/Bass Multi-Tool (£12.99) - but it also offers something a little more extensive with its Guitar Tech Kit. 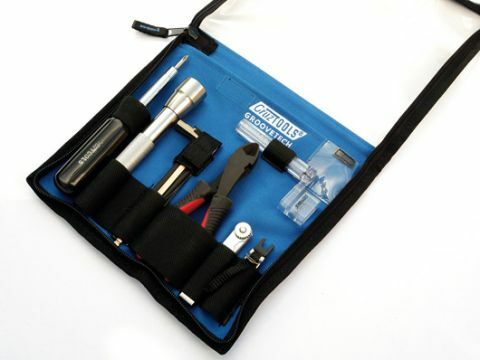 It includes a well-written 'Easy Setup Guide' and we get a six-in-one screwdriver with two sizes of cross- and flathead tips plus two hex sockets, a bright three-LED flashlight, 11 metric (gold) and imperial (black) Allen keys (those for truss rods have ball-ends), string cutters, thickness gauge, a capo (ideal for measuring neck relief) and a string winder. While the GrooveTech Guitar/Bass Multi-Tool is one of the best we've encountered, the full Tech Kit is near perfect for all the basic DIY adjustments from string changing to truss rod/relief adjustments, pickup height and intonation. It's all in one place too! That flashlight is essential for backstage environments and only the clear plastic string winder lets the kit down - it should be a gaudy bright colour. High quality tools don't come cheap but for an all-in-one solution for your own guitar tech needs we'd strongly recommend either the GrooveTech Guitar/Bass Multi-Tool or the more expansive Guitar Tech Kit. Is it too early to ask your spouse for a Christmas present?